Mountain Pet Rescue was founded in January of 2012. Since then, we have successfully adopted out over 1600 pets into loving forever homes. Here are some of our favorite “tails” of success. 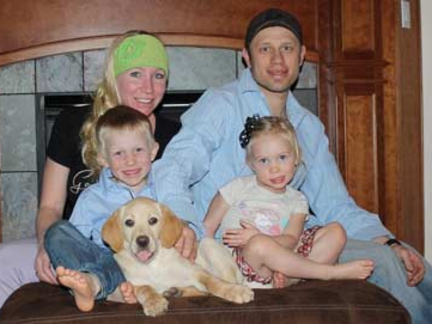 The Owens had been in search for a new dog ever since their Alaskan Malamute, Diesel, had to be put down due to cancer. Diesel had been in the family for nine years, and he is very missed by the Owen family. Since his death, the family knew they wanted another big dog. They had been searching for a few months before they found James, a dog that was rescued from a shelter through Mountain Pet Rescue. They had seen a photo of James’s sister in the newspaper. Mountain Pet Rescue strives to find the perfect fit for its rescue dogs by screening adoption applications and, in some instances, visiting the home of the potential adopters to ensure a good relationship between the dog and the potential family. The Owens have two children and two other dogs – two Pugs– who all get along great with James. Tara says James even sleeps right next to the Pugs at night, and plays with them during the day. Sounds like James is one lucky pooch! Thank you Owens family! View More “Tails” of Success Here!